Check out today's prep team spotlight on the Lafayette Christian Academy Knights as they get ready for their Division IV title defense this Friday! Check out today's prep team spotlight on the Loyola College Prep Flyers, which is a team that is soaring to lofty postseason expectations after a current 6-3 record with one game left to go until the end of the regular season! LAFM TV Show! 13th Season! Episode 7 Now Available on YouTube! October 30, 2018	Comments Off on LAFM TV Show! 13th Season! Episode 7 Now Available on YouTube! 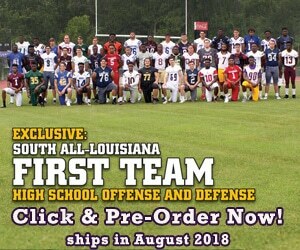 Check out today's prep team spotlight on the Opelousas High School Fighting Tigers as they are making great strides under second year Head Coach Doug Guillory! Check out our Week 9 Recruiting Recap featuring Breaux Bridge High School, East St. John High School, and Opelousas High School! LAFM TV Show! 13th Season! Episode 6 Now Available on YouTube! October 26, 2018	Comments Off on LAFM TV Show! 13th Season! Episode 6 Now Available on YouTube!